NOTE: In this blog I strive to provide original content and not a rehash of the daily news. However this is an important editorial that deserves widespread distribution. Subscribers to the Wall Street Journal can access the original editorial here. Others can read below. The political chasm in Hong Kong just keeps getting wider. Opposition politicians want Beijing to follow through on vague promises to allow residents to elect their leader by universal suffrage. Meanwhile the mandarins worry that full democracy will allow a future charismatic figure to challenge their authority and ignite demands for elections on the mainland. To forge a compromise plan, the city desperately needs its current chief executive to step into the breach, but Leung Chun-ying has remained strangely silent. The latest kerfuffle began when Benny Tai, a law professor at Hong Kong University, proposed a campaign of civil disobedience to put Beijing’s feet to the fire. His plan actually starts out conciliatory, with numerous off-ramps for compromise. These include a “deliberation day,” during which participants are supposed to form little discussion groups to talk about their visions of political change. If Beijing still doesn’t come to the table, however, the plan culminates in a mass rally known as “Occupy Central.” Tens of thousands of protesters would flood Hong Kong’s central business district on July 1 next year, effectively shutting down this Asian financial capital. This threat sure got Beijing’s attention, but if anything China’s leaders have dug in their heels on democracy. A series of top party members have come out in force to declare the ground rules for selecting Hong Kong’s next chief executive. Yu Zhengsheng, the chairman of the CPPCC National Committee, warned against using the chief executive’s office to undermine mainland politics; he stressed the importance of patriotism and the need for the chief executive to “love the nation and love Hong Kong.” Zhang Xiaoming, director of China’s Liaison Office in Hong Kong, said there must be a process by which candidates are vetted by Beijing for their “suitability.” Qiao Xiaoyang, the chairman of the Hong Kong Basic Law Committee, elaborated that candidates who did not accept one-party rule in China would be disqualified. This is the vicious cycle Hong Kong feared all along. Residents increasingly feel that they are being strung along with stall tactics because Beijing has no intention of honoring its commitment to universal suffrage. Frustrated by the lack of progress, they are more willing to challenge Beijing head on. Even the more moderate politicians have been forced to go along with this trend lest they be marginalized. This radicalization only realizes Beijing’s deepest fears about allowing greater democracy. Its real concern is that residents of towns and cities on the mainland will emulate Occupy Central and mobilize for greater autonomy of their own. There are still some cooler heads around and hopefully they will prevail. Academic experts on both sides have called for compromise. Even Hong Kong’s former Chief Secretary Anson Chan has weighed in, saying that it was not unreasonable to expect the city’s chief executive be able to cooperate with Beijing. 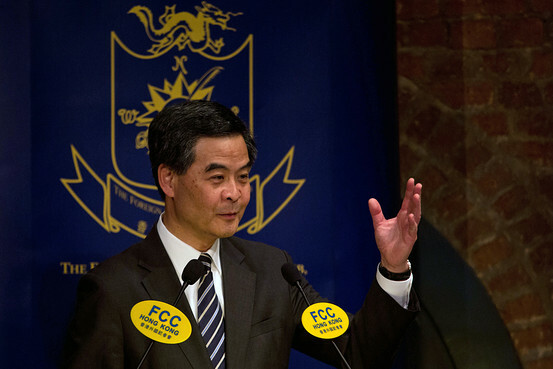 Which brings us to Hong Kong’s current chief, Leung Chun-ying. Appointed by the central government last year, he is considered one of the Party’s most trusted allies. And while we expressed concern at the time that Mr. Leung’s policies on education, health care, land reform and the judiciary might eventually turn Hong Kong into just another Chinese city, he surprised us by advising Beijing against implementing a “patriotic education” curriculum in Hong Kong’s state-funded schools, and we praised him for it. But ever since Mr. Tai introduced his Occupy Central plan, Mr. Leung has stayed on the sidelines of the debate. It’s as if he’s been pushed aside by more powerful forces from Beijing. Now more than ever Hong Kong needs leadership. Mr. Leung may not have been democratically elected, but he could still act as a bridge between the interests of mainland China and the people of Hong Kong, who are growing increasingly frustrated that their views are not heard in Beijing. Their desire for self governance stems from the disconnect between their maturing political culture and China’s outmoded means of central and unaccountable government. By remaining silent, Mr. Leung only demonstrates why the people of Hong Kong need a leader who will represent them.